Celebrating the prominent symbols of the Persian era revealing their most intense beauty and brilliance, Magic Carpet collection draws inspiration with a harmonious interplay of fine gems and precious diamonds. A unique melange of fine Japanese Keshi pearls with sparkling fine diamonds, various precious coloured stones overlay pearls in an intricate mesh. Shapes and forms intertwine into smooth sinuous lines with fluid, graceful shapes. A delicate mesh of fine Japanese Keshi pearls is intricately woven to highlight the beauty of floral motifs crafted in 18kt gold and set with 6.85 carats of round brilliant cut and rose cut diamonds with accents of Burmese blue sapphires and pink cultured pearls. 3.20 carats of round brilliant cut diamonds in floral motifs and accents of Zambian emeralds overlay a fine mesh of Japanese Keshi pearls. Fine Burmese blue sapphires and moonstones are interlocked with fine Japanese Keshi pearls. 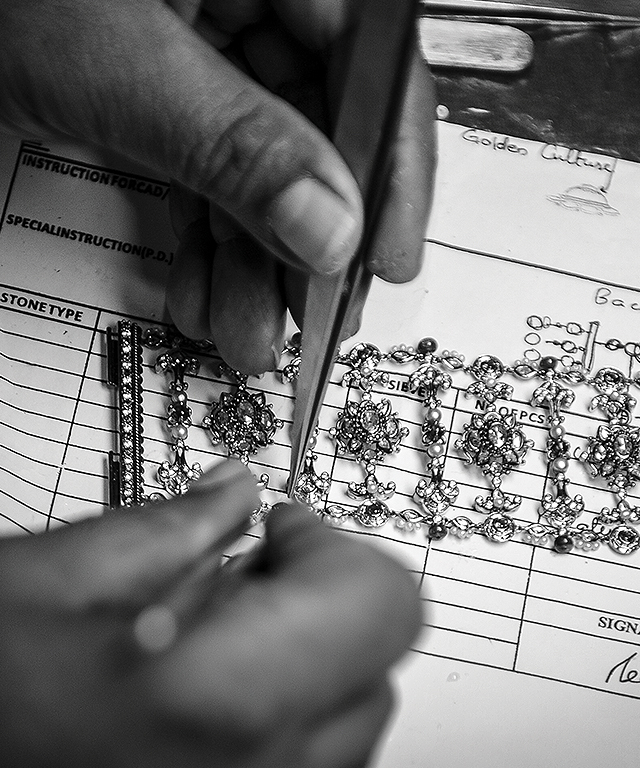 Round brilliant cut and rose cut diamonds elaborate into floral motifs in this elegant Magic Carpet bracelet. 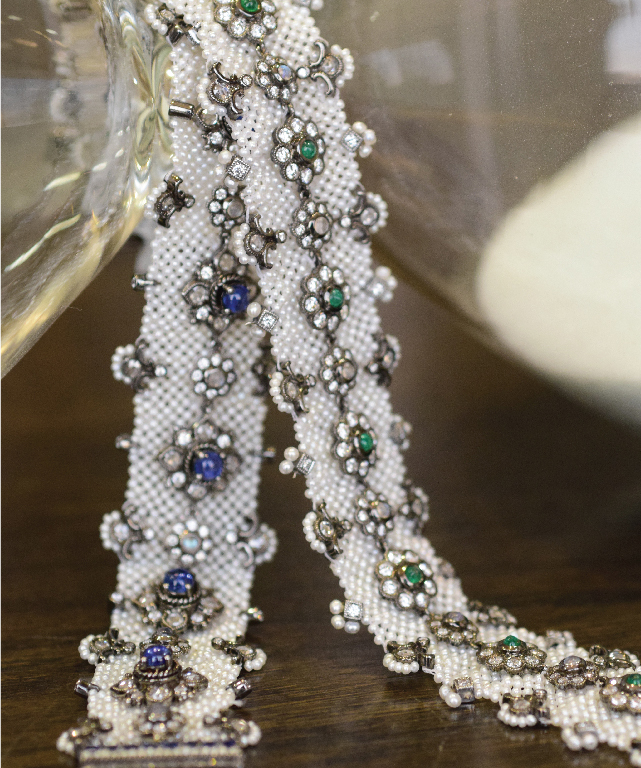 47 carats of fine Japanese Keshi pearls are accentuated by Zambian emerald beads as 6 carats of baguettes, round brilliant cut and rose cut diamonds transform into eloquent patterns in this bracelet. 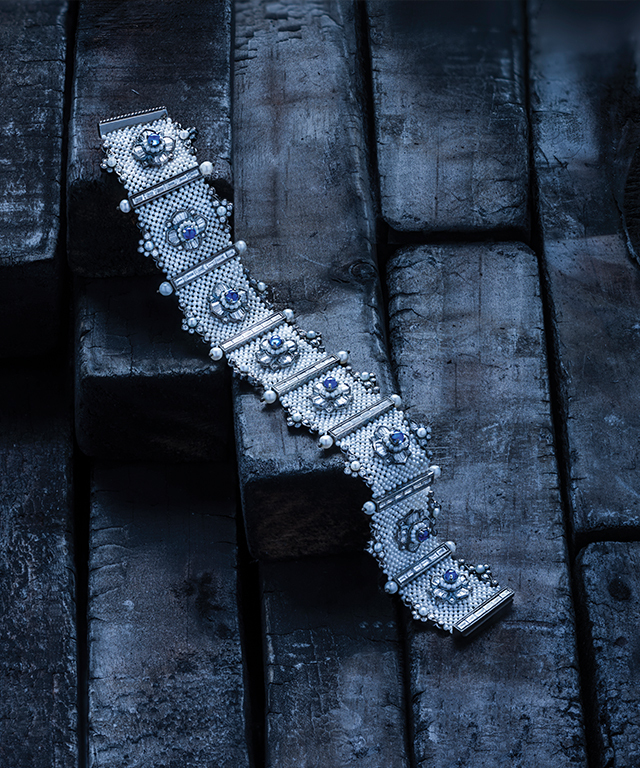 3 carats of round brilliant cut, baguettes and rose cut diamonds in symmetric patterns form delicate motifs in the hinge, while fine Japanese Keshi pearls enmesh in this bracelet.